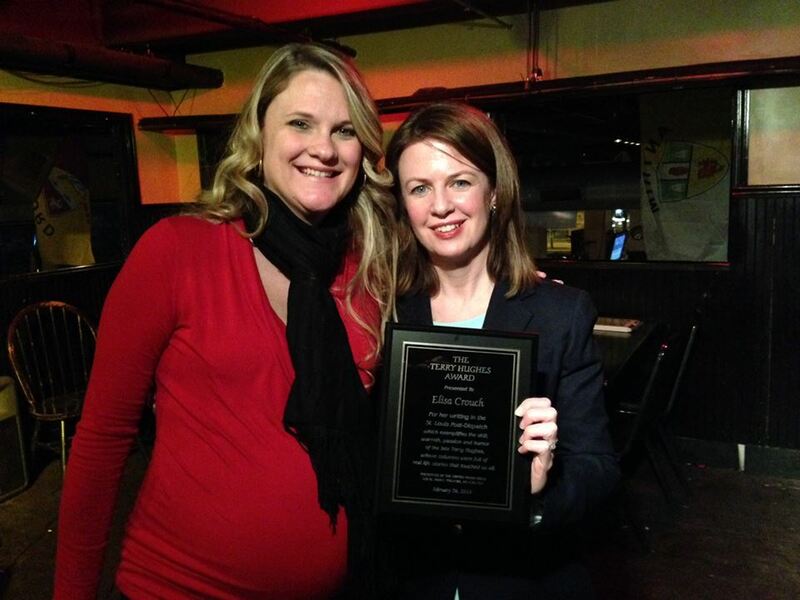 St. Louis Post-Dispatch reporter Elisa Crouch received the 2014 Terry Hughes Award from the United Media Guild during a reception Wednesday night. A panel of former Hughes Award winners selected her work for this honor, given annually by the UMG in memory of one of the Post-Dispatch’s greatest journalists. The Hughes Award is open to any journalist working for a newspaper, magazine or on-line operation in the St. Louis area. The UMG received a dozen outstanding entries from various media outlets. But Crouch’s reporting on the Missouri school transfer program stood out. Her stories looked past the political infighting and explored the impact the program had on students, families and communities. Post-Dispatch reporter Christine Byers, last year’s Hughes honoree, presented Crouch with this year’s award. Terry Hughes was 36 when she died of breast cancer on July 22, 1991. Her writing in the Post-Dispatch was clear, witty and descriptive, with a flair for portraying society’s underdogs. Some of her columns chronicled the bouts with cancer that she and others faced. One column was credited with helping persuade the Missouri Legislature to approve a bill forcing insurers to pay for mammograms.